PROPERTY developer Eastern and Oriental Bhd (E&O) sees its hospitality activities in Penang receiving a boost this year with the reopening of its four-star Lone Pine Hotel along Batu Ferringgi. The company, which is synonymous with the 125-year-old Eastern & Oriental Hotel (E&O Hotel) in George Town, is also expecting this hotel's extension, known as the Annexe, to be completed in 2012. E&O managing director Datuk Terry Tham said the 50-room Lone Pine, which closed its doors for a RM50 million refurbishment in April last year, will reopen by the fourth quarter of the year. "The refurbished property will boast of a spa, restaurants, a bigger pool and upgraded rooms," Tham told a media briefing in Penang yesterday. Also present was E&O executive director Eric Chan. Tham was in Penang to launch E&O Property Development's Quayside Seafront Resort Condominiums. The upscale project is a component of the Seri Tanjung Pinang waterfront development, which is being tagged by the developer as the new millionaires' enclave on Penang island. On the Annexe, Tham said the 15-storey extension, when completed in 18 to 20 months, will see the E&O Hotel offering an additional 139 guest suites along with retail, food and beverage components as well as a spa. "The podium area will have more extensive meeting and banqueting facilities and we will also offer a bigger pool," he added. Meanwhile, ahead of its official launch, the Quayside condominium project has already received some 100 bookings from both foreigners and locals for the more than 300 units in the first block, Chan said. Conceptualised by international achitects WATG, Quayside's point-block design comprises five high-rise towers and two low-rise blocks. GEORGE TOWN: Eastern & Oriental Bhd is targeting 2012 for the completion of the Eastern & Oriental Hotel extension project known as the Annexe. Group managing director Datuk Terry Tham told a press conference that about RM150mil was spent on the construction of the Annexe, which would add another 139 suites for Eastern & Oriental Hotel, increasing its total number of suites to 240. ”The other components include a spa, a swimming pool, restaurants, and retail outlets,” he said. Tham added that the original 28-storey height of the Annexe had been reduced to 15 storeys to comply with George Town’s heritage conservation guidelines. He was speaking after the presentation of the group’s RM1.8bil Quayside project by the US-based consultants. Tham said the group’s Lone Pine Hotel, currently under renovation, would be ready in the final quarter of 2010. ”The completion of the renovation will increase the number of rooms to 90 from 50 previously. ”We are spending RM50mil for the renovation,” he said, adding that the last time Lone Pine Hotel underwent a facelift was in 1999. On the group’s Quayside project, Tham said between 30% and 40% of Quayside’s gross sales value of RM1.8bil was spent for consultants on security, landscape, and architecture. ”We have received queries for about 110 condominium units of the first block Quayside project,” he said. The first block of Quayside has 298 units and is located next to Straits Quay, which comprises a serviced suite component and a 250,000 sq ft marina and retail space that will be leased to food and beverage outlets. ”We will be going overseas in March to promote Quayside,” Tham said. Tham said the master plan for the second phase of Seri Tanjung Pinang would be ready by 2017. ”We are taking into account the environmental factors in doing the master plan. ”We have till 2017 to reclaim 740 acres of land at Tanjung Tokong for the second phase,” he said. The evening traffic jams at PJ Section 16 are a daily problem. With the economic recovery and renewed interest in property buying, there is bound to be more project launches in the coming months. Instead of just going ahead with their project plans individually or on an ad-hoc basis, it is important for industry players and the authorities to actively engage with each other and look for ways to further improve our towns and cities. Town planners, developers and the approving authorities should always look at the big picture and take into account the needs of the people in the years to come. Instead of just planning for the needs of the current population or the new project in question, planning for new roads, public amenities such as schools, markets, town halls and even bus stations should be for a longer-term period of 10 to 20 years at least. The public should be kept informed of any new developments that are coming up in their areas to invite their feed back and proposals. By promoting a more consultative approach in our development plans, we will be able to plan ahead and have in place solutions for some of the “expected” future problems even before they crop up. It has become almost a perennial problem to find that when a township starts to mature and is joined by other newer developments a couple of years later, the roads leading to and out of the township will be choked up. An easy litmus test to find out whether there has been forward planning by the approving authorities is to take a quick look at how congested the roads are. Having the advantage of knowing in advance the number and size of new projects submitted for approval and how many projects will be approved in a certain locality, the planning authorities should ensure that sufficient infrastructure be provided way in advance. This calls for a thorough master planning on the part of the authorities and they will have to tabulate the growth in population and estimated number of vehicles. The tasks of getting these facilities ready should be delegated to the responsible parties. Heavily congested roads are a common sight in many housing estates and commercial areas in Kuala Lumpur and the Klang Valley these days. One of the most obvious handicap faced by many of our townships and cities is that the road infrastructure does not take into account the rising vehicle population and are now literally bursting at their seams. 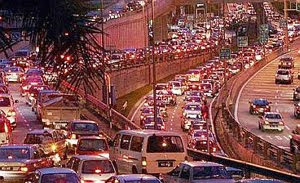 Traffic jams in and around Kuala Lumpur and the Klang Valley are worsening by the day and many roads are badly choked. It is no wonder that Klang Valley folks are spending more time in their cars just to get to and back from work. With the rainy season here again, the traffic snarls will only get worse. The daily clogged up roads and the incessant jams are certainly one of the biggest inconveniences for city folks who have no choice but to put up with the bad jams day in day out. Most of them still choose to drive because the inadequate and poor state of the public transport system does not provide them with any alternative. Besides wasting a lot of time on the road, they are also sapped of their energy and have to fork out higher fuel bills. The infamous Phileo Damansara crawl is well known among Petaling Jaya folks. The traffic crawl after office hours sometimes start from the car park basements. Many questions have been raised on how the authorities can approve so many blocks of office buildings in the area when it is only served by one main entry and exit road. Luckily the ramp that was completed in 2002 has managed to divert traffic heading to Kuala Lumpur from the main exit. It will save a lot of time for the many office workers in the area if there is a reliable public transport system in place to serve them. With the many blocks of office buildings and nearby townships in Section 16 and 17, the area can certainly do with a light rail transit line and station to serve the many office workers and local population. It is about time we revisit plans to upgrade our public transport infrastructure and ensure that they are equipped with the right facilities to attract more commuters to use them. Let’s get our act together and do as much as possible to ensure the people’s incessant calls for a more functional and efficient public transport system becomes a reality soon. In our drive to promote higher quality of life among the people, having well planned infrastructure including a good functioning public transport system is not an option but a necessity. Deputy news editor Angie Ng believes the country’s quality of life index will go up many notches if the public and private sectors are more far sighted and work hand in hand as partners in progress. The world is emerging from one of the toughest economic downturns in a while, and for the shopaholic in all of us, 2010 seems like a good time to unleash that pent up demand that has been building up since the crisis hit in late 2008. Real estate agents and industry observers are cautiously optimistic that the local retail market is expected to see some growth this year, but it won’t be spectacular. Khong & Jaafar Sdn Bhd managing director Elvin Fernandez says the health of the local retail market is dependent on the level of consumer spending. Fernandez says “underlying risks” exist that may scuttle consumer spending this year. “The global economy may weaken, the Malaysian economy may experience weak growth. Subsidies may be moved; all these could lead to households tightening their spending,” he tells StarBizweek. Conversely, there are also indications that the retail market could be in for good times, say Fernandez. “There is that potential. We see better tourist arrivals and spending this year largely because of low-cost carrier travels,” he says. According to Fernandez, rental rates of downtown shopping centres (namely Suria KLCC and Pavilion in Kuala Lumpur) and suburban shopping centres (like Midvalley in Kuala Lumpur, One Utama and Sunway Pyramid in Selangor) have been holding steady for a while. Rent for average prime space at downtown and suburban shopping centres are averaging between RM50 to RM60 per sq ft and RM35 psf respectively the past couple of years. “Even in the downturn areas, rates have remained steady. We don’t expect them to shoot up suddenly this year,” says Fernandez. Richard Chan concurs that retail rental rates are likely to hold steady. Malaysian Association for Shopping & Highrise Complex Management advisor, Richard Chan concurs that retail rental rates are likely to hold steady, adding that the sub sector would probably experience single-digit growth due to the improved economic conditions and improved consumer sentiment. Despite better days ahead, Chan says there would not be an oversupply of retail space, especially within the Klang Valley area as it is already over-populated. “There are over 130 shopping stores in the Klang Valley alone!” Neither does he expect many new malls being built this year. According to Henry Butcher Retail, among the shopping centres that completed and opened (whole or part) in the Klang Valley last year include Bangsar Shopping Centre Phase 3, USJ 19 City Mall, IOI Mall Phase 2, Wangsa Walk, Solaris Dutamas, Subang Avenue, Plaza RAH and Giza Dataran Sunway. 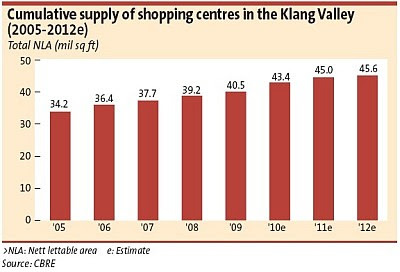 New retail supply within the Klang Valley dipped to 1.4 million sq ft in 2009 versus 1.7 million in 2008. Henry Butcher estimates new retail supply to grow to 4.4 million sq ft this year. Allan Soo says the retail market had picked up in the fourth quarter of 2009. Regroup Associates Sdn Bhd managing director Allan Soo expects the local retail market to grow less than 5% this year, with growth from existing malls within the Klang Valley. He says new malls would not contribute to growth because they needed to “struggle” initially to build their business and attract consumers. Soo distinguishes the retail market by location or ‘tiers,’ namely the first tier (Klang Valley), the second tier (Penang and Johor Baru) and the third tier (small towns in states other than the first two tiers). Soo says the retail market in Malaysia had picked up in the fourth quarter of 2009, estimating that it grew less than 1% for the whole year. “In the last three months of 2009, retailers saw good growth due to pent up demand from 2008 to early 2009. There was also a notable tourist increase during that period. We believe that this momentum will be carried into 2010. Despite improved sentiments, there are still underlying worries that the Malaysian economy may be less competitive or the possibility of a double-dip recession in the global economy,” he says, adding that the local retail market could pick up further in the second half of this year. Retail outlets selling essential goods could continue to perform well, even in times of inflation. Tan Hai Hsin forecasts the retail market to grow 5% this year. Henry Butcher Retail managing director Tan Hai Hsin also forecasts the retail market to grow 5% this year, adding that it was likely to have grown 0.8% in 2009. “The Klang Valley remains the key driver of retail sales for the entire Malaysia. They account for about 40% of the total retail sales in Malaysia,” he says, adding that the average occupancy rate of shopping centres in Klang Valley last year was 86%. “They are also the most affected states during the economic crisis. The largest drop in consumer spending and the largest number of store closure also took place in these two states during bad times,” Tan says. “Penang is highly dependent on the export and manufacturing sectors and was affected by the crisis while Johor Bahru has been affected by Singapore recession,” says Tan. He adds that the average occupancy rate of shopping centres in Penang and Johor Bahru was 69% and 62% respectively last year. Does Sime Darby need Sunrise? Last week, one property deal was a bit of a puzzle when all the pieces refused to fit snugly no matter which way you moved them around. That was the deal by conglomerate Sime Darby to develop a RM1bil commercial development in its established Bukit Jelutong housing area in Shah Alam with another property developer, Sunrise. The questions are: Why does Sime Darby, a developer with a long and varied track record, need Sunrise, an established condominium developer with limited experience in commercial development, to put up a commercial centre? Has not Sime Darby more expertise than Sunrise in this area? First the facts. Sime Darby and Sunrise will have equal stakes in a joint venture to develop 20.95 acres in the 180-acre Bukit Jelutong township. The land comes from Sime Daby’s huge land bank, probably the largest in the country. The price of the three pieces of freehold commercial land is RM114mil, or RM125 a sq ft. That is a rather good price for a buyer considering that the gross development area is 2.7 million sq ft and it is a RM1bil project. In fact, one may be hard put to buy residential land in Bukit Jelutong at that price now! The project will consist of retail, shopoffices, office-suites and serviced apartments. It will be launched and developed in 5 phases from 2011 onwards. The overall project is expected to be completed seven years from the launch of the first phase. If one breaks up the profit from the project and allocates it over the years, it does not really make much difference to Sime Darby. If we assumed a 20% gross margin, gross profits for the whole project would be RM200mil and over seven years that amounts to less than RM30mil per year. The half share for each party will be less than RM15mil a year. On a proportionate basis, that makes a lot more difference to Sunrise’s bottom line than Sime Darby’s which is a giant of a company with the largest market value of any listed company in Malaysia. So what is in it for Sime Darby? The company says it is trying to accelerate property development. Sime Darby is also one of the largest, if not the largest property developer, in Malaysia with a considerable amount of resident expertise. But in return for expertise from another developer, it is selling its share of the land at a very low price and forsaking half of the profit from the development venture to its partner. Could it not at least have obtained a better deal for itself? And why can’t Sime Darby develop the land itself? Many of us will recall Sime Darby as the developer of the very successful and massive Subang Jaya township which included the development of a very vibrant mall together with a commercial centre. That is clear indication that it has all the expertise that it needs in-house. If it lacked for anything in any particular area, it would be quite easy to purchase the expertise initially and develop it in-house after that. After all, there are many architects, consultants, designers and planners who will do this job for a fee and to whom you will not have to surrender 50% of profits through a joint venture. On top of that, the hinterland for this commercial development is already there – Sime Darby’s Bukit Jelutong is a very successful residential property venture and already has 25,000 people staying there. That makes it much easier for the commercial development to succeed. Sime Darby has hundreds of thousands of acres of plantations. Land banks with development potential number in the tens of thousands of acres. If it does not have sufficient in-house capacity to develop these, it had better develop it fast. Meantime it can buy it. Otherwise, it is going to needlessly pass on profits which could be its own to other developers, in this case, a developer much more junior and smaller to it and which has a much narrower area of expertise. Sunrise’s one major commercial development is Solaris in Mont’Kiara, incidentally its area of concentration. As a major government-linked company substantially owned by Malaysian trust agencies and funds, Sime Darby must be always mindful to extract the best value for its shareholders, especially from valuable land banks which it has held for decades. Whichever way one tries to fit the pieces, there is just one conclusion – the deal benefits Sunrise much more. It gets valuable land at a very reasonable price from a competing and competent developer, manages it and reaps equal profits from it. How much better a deal than that can one get? And why? Managing editor P Gunasegaram often has trouble understanding strategic moves by Malaysian listed companies. PROPERTY trust players in Malaysia hope the Securities Commission (SC) will relax restrictions to allow them to raise funds in the equity capital market more quickly and efficiently, says the chief of one of the larger players. "We hope the regulator will basically give real estate investment trusts (REITs) a bit of a clear run to raise capital, as the market comes back, to get their capital base up. At the moment, it (the rules governing capital raising) is quite restrictive," said Stewart LaBrooy, chief executive officer of Axis REIT Managers Bhd. Axis REIT Managers is the manager of Axis REIT, the country's fourth largest listed property trust in terms of asset value, and third largest by market capitalisation. LaBrooy exlained that REIT players need to be able to raise funds whenever there's a good opportunity to buy property. Private placements, rather than rights issues, are the preferred method to raise cash as these are less risky, less expensive and quicker to do provided they are done in a non-dilutive manner, he said. But under existing SC rules, REITs can place out new units of only up to 20 per cent of their unit base. Furthermore, this can be done only once every 12 months. Such restrictions hold back REITs' portfolio growth, LaBrooy said. "As a result, Malaysian REITs are largely ignored by many institutions due to their illiquidity and small market capitalisation, which leads to unexciting share price performance," noted a REIT analyst at Kenanga Research. Malaysian REITs need to be able to quickly build up their portfolios to US$500 million (RM1.72 billion) if they are to interest foreign funds at all, LaBrooy said. The newly formed Malaysian REIT Managers Association, led by LaBrooy, is now pushing for changes in these rulings to expedite capital raising activities. "For example, keep the 20 per cent cap in place but remove the 12-month time limit until we get to a certain size, and then reimpose it if necessary," he suggested. Easing the rules may also encourage more REITs to list, he remarked. Axis REIT is currently seeking an SC waiver on the 12-month time-limit for its proposed placement of 61.4 million new units to raise RM113 million for new acquisitions. It last did a placement less than a year ago. Analysts said the timing is good for such an exercise as its unit price is now trading at a premium to its net asset value of RM1.79. It closed at RM1.96 yesterday. It needs the funds to buy five properties this year, aiming for its total portfolio value to breach the RM1 billion mark soon. Axis REIT currently manages 21 properties in Malaysia with total value of RM907.7 million. These range from offices and warehouses to logistic centres.